With the number of requests for cell lines flooding into Milstein's laboratory, Milstein and his team soon realised they could not handle the distribution of the cell alone. Help would come from an unexpected source: David Murray, founder of Sera-Lab, a company producing and marketing antisera as a research reagent for scientists. This shows David Murray in 1978 when he was awarded best business award on Thames Television award. Photo credit: Jenny Murray. Click here to see David Murray's profile. 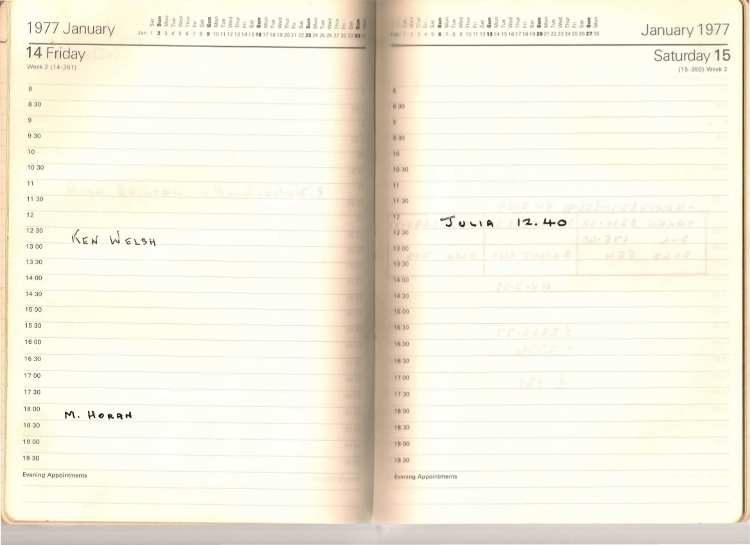 Click here to see Murray's diary and his initial correspondence with Milstein. 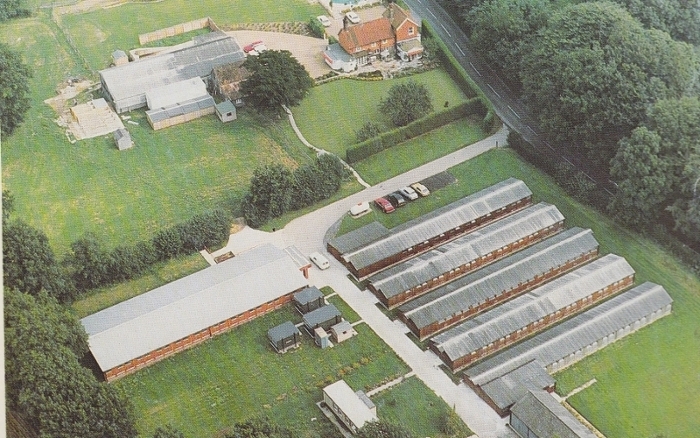 Murray had first been alerted to Milstein's work by a meeting he had with the immunologist Ken Welsh, who was based at Queen Victoria Hospital in East Grinstead, not far away from Crawley Downs in Sussex where Sera-Lab was located. Murray already had an association with Welsh's department, being a regular supplier of rabbit antiserum for research purposes to Richard Batchelor, Welsh's superior. He also had strong links with the hospital's chief technical officer, Ron Chambers, who helped him found his company Sera-Lab in 1971. 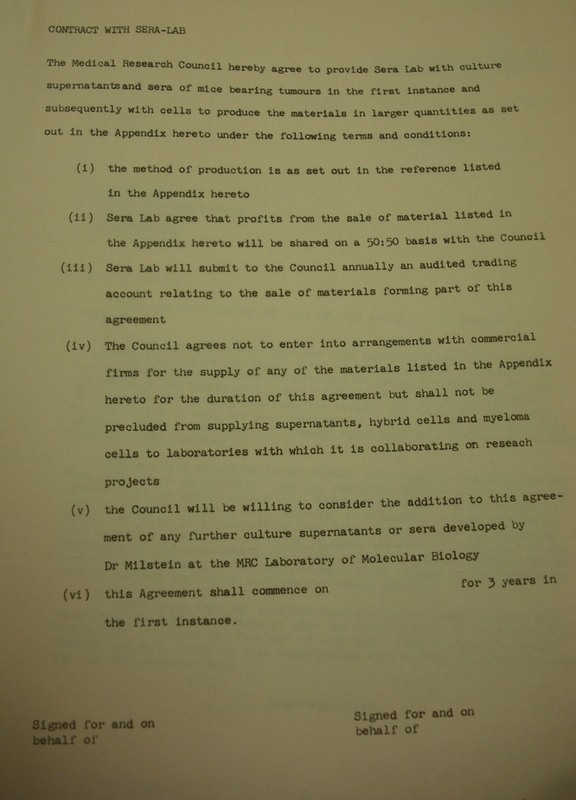 One of Murray's first meetings with Welsh was in January 1977 shortly after the latter learnt of the NRDC's decision not to pursue a patent for Köhler and Milstein's technique for producing monoclonal antibodies. 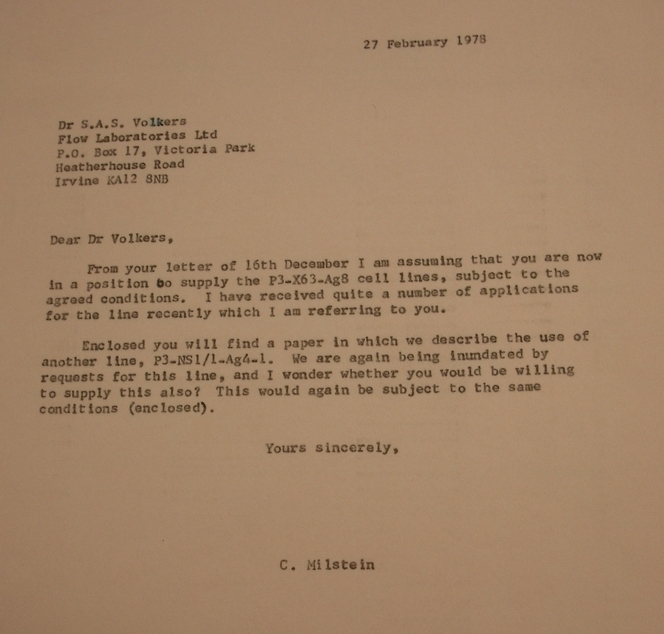 At that time Welsh was in the midst of a series of negotiations with a number of company executives to see if they could help and he urged Murray to look at the article published by Köhlerand Milstein in Nature in August 1975. Excited by the prospect monoclonal antibodies promised for his own business, Murray immediately wrote to Milstein to find out whether they could collaborate. 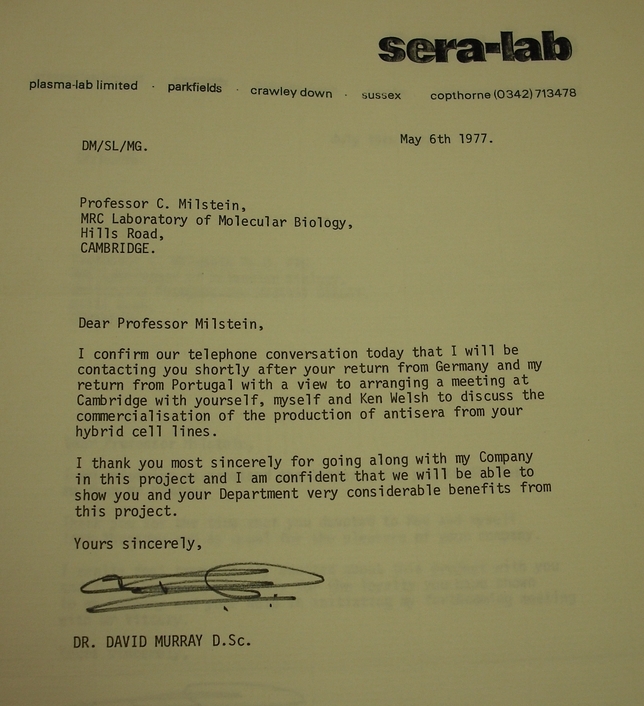 In February 1977, shortly after posting his letter, Murray encountered Milstein in person by chance on one his sales rounds for his company's foetal calf serum, a critical reagent for tissue culture. Knocking on the door of what, unbeknown to him, was Milstein's office, Murray, not recognising Milstein, launched into a sales pitch for the serum. 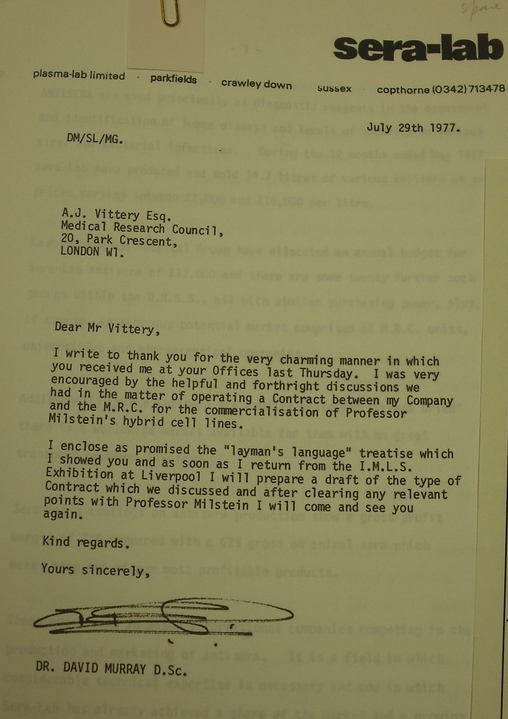 He was quickly interrupted, however, by Milstein, who withdrew Murray's letter from under his pile of papers. Murray recalled that it was only at that moment that he realised whom he was speaking to. The discussion soon shifted to the headache Milstein was experiencing in meeting the flood of requests for his cell lines. On hearing of Milstein's frustrations, he quickly realised his company could probably help with their distribution. This shows staff at Sera-Lab bottling up foetal calf serum. The photo appeared in Sera-Lab's catalogue, 1986. Credit: Jenny Murray. According to Milstein, although he had been aware of the commercial potential of monoclonal antibodies, prior to this meeting with Murray he given little thought to the practicality of such an endeavour. 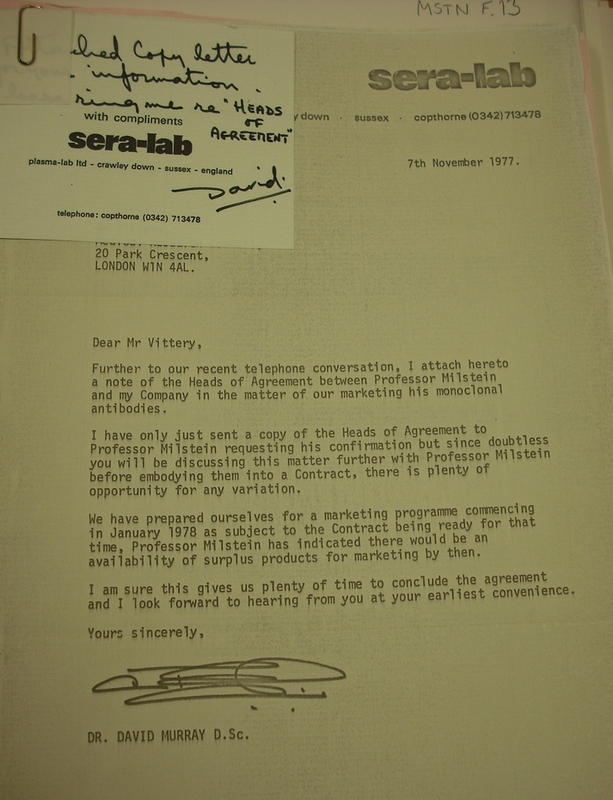 What Murray offered him was an arrangement whereby Sera-Lab would distribute the monoclonal antibodies for Milstein, at an agreed cost and would return a proportion of the Sera-Laboratory's profit on the antibodies to Milstein's laboratory. Attracted by Murray's proposal, Milstein immediately got in touch with the Medical Research Council, which agreed to the proposal. For Milstein his meeting with Murray was, as he put it, 'the starting point at which I started to think more seriously about the [commercialisation of monoclonal antibodies]. In my innocence, I thought if we could do that at the level I was talking about, a minor antibody being distributed by a commercial firm, we might do it on a larger scale, with a future, more important monoclonal antibody.' 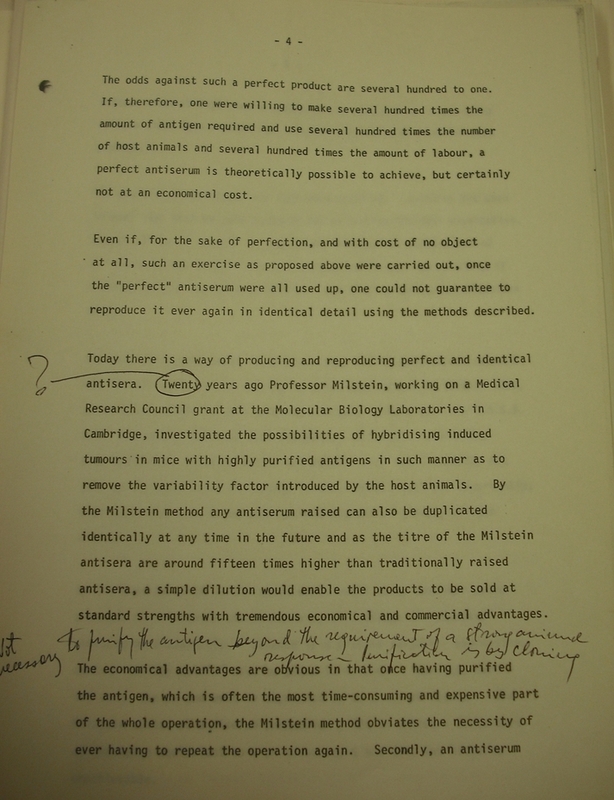 (Milstein's draft manuscript entitled, 'Messing about with isotopes', p.30, Churchill College Archives, Milstein Papers, file MSTN/D23). 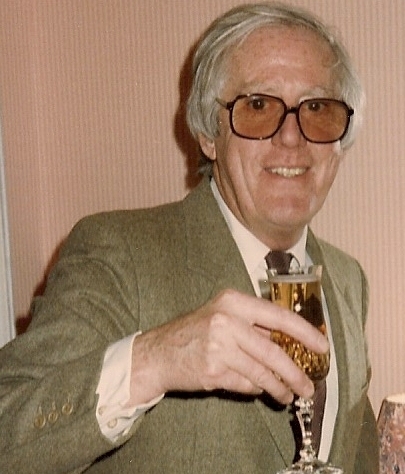 Murray believed that monoclonal antibodies could slot into the already well-established market for antisera, that is blood serum containing antibodies. The antibodies contained in such sera were an important tool in the diagnosis of many diseases. They had been used for diagnostic tests since the late 19th century, based on observations that they could disintegrate (lyse), separate (precipitate) or clump together (agglutinate) bacteria in a solution. The reaction between an antigen and an antibody also had predictable biochemical reactions. Within this context the antibodies in antisera could be used as diagnostic probes to define, isolate and measure a wide variety of immunological molecules. The first antiserum-based test was the Widal Test, introduced for diagnosing typhoid in 1896. This was to be followed by the Landsteiner Test for blood grouping (1900-1) and the Wassermann Test for detecting syphilis (1906). Over the years many other tests followed. One of the most important was the Coombs anti-globulin test developed in 1945, widely used for detecting antibodies that can cause premature red blood cell destruction. The Coombs test is particularly important in blood transfusions and detecting Rhesus (Rh) incompatibility between the blood of mother and foetus. 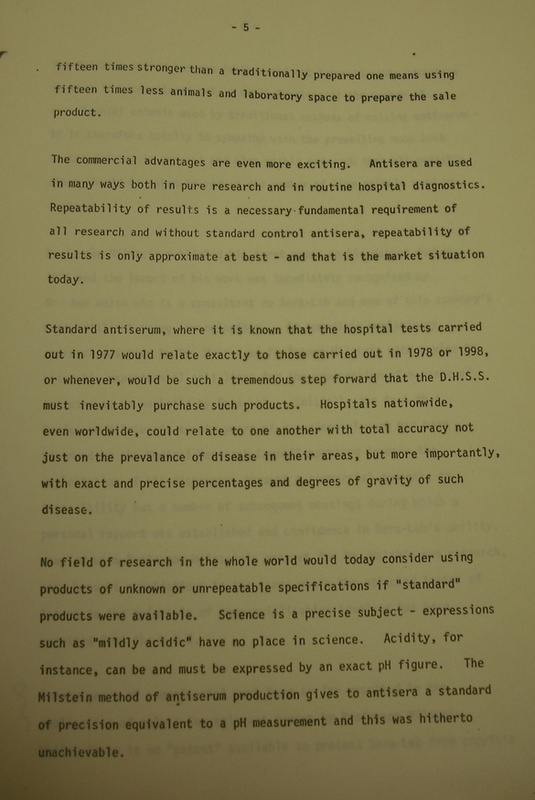 By the 1960s the use of antisera for diagnostics had become widespread in clinics and hospitals, aided in part by the emergence of electrophoresis and labelling techniques using firstly enzymes and then radioisotopes. 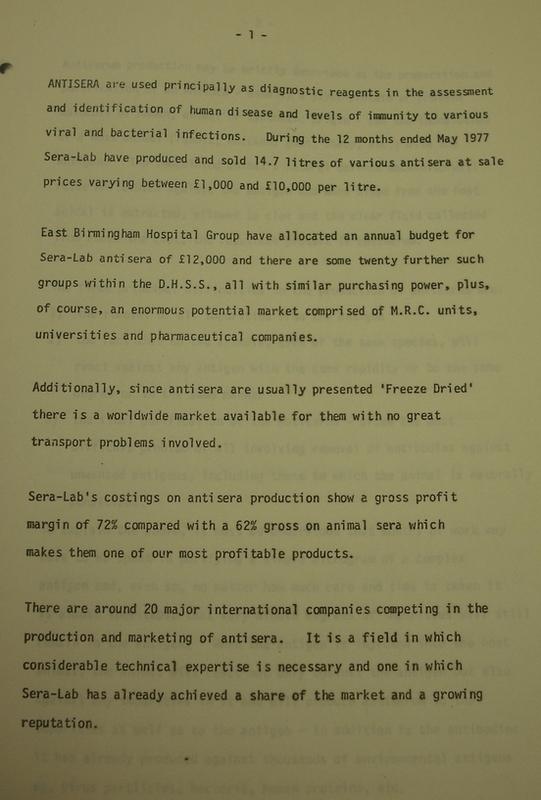 Some idea of how large the market for antisera was can be seen from the fact that Murray believed there to be around 20 major international companies competing in the space and that many hospitals had specific budgets set aside for the purchase of antisera. This, he pointed out, provided a ready market for monoclonal antibodies. This photograph shows Sera-Lab's headquarters. The photo appeared in Sera-Lab's catalogue, 1986. Credit: Jenny Murray. According to Murray, monoclonal antibodies offered exciting prospects for routine hospital diagnostics. He argued they offered the chance for more accurate and more replicable results. This is particularly striking because at this stage Milstein and his colleagues were only just beginning to investigate the practical utility of monoclonal antibodies for diagnostic applications. Nor was everyone at this time convinced that monoclonal antibodies provided any particular advantage over conventional antibodies as diagnostic reagents. For Murray's own serum production business, however, Milstein and Köhler's technique not only opened up the possibility of producing standardised identical antibodies with known specificity, it also promised to cut down on the labour intensity of the production process. This, in turn, would reduce costs and increase potential profits. 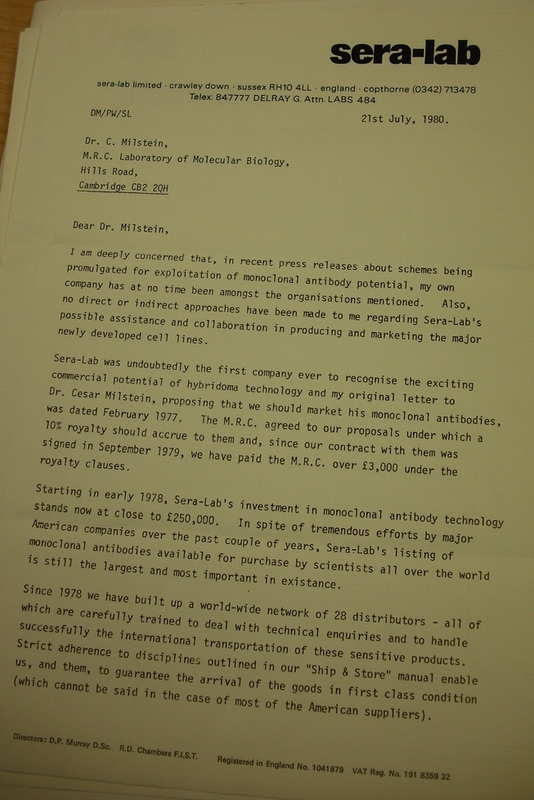 Click here to see the business proposition Murray sent to the MRC headquarters for monoclonal antibodies. 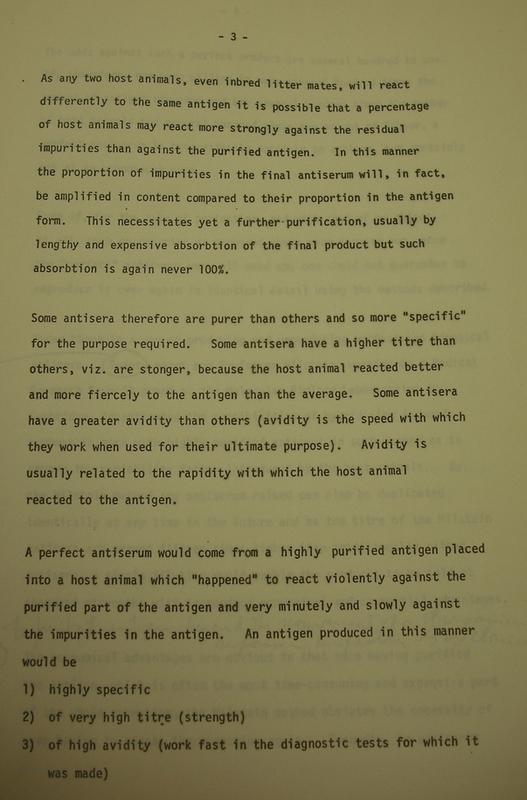 A further important advantage Murray ascribed to the new method was the possible reduction in the number of animals needed in the production of antisera. Before Milstein and Köhler developed their technology, animal-based antiserum could only be made in small quantities, so that large numbers of animals had to be immunised for production, and each batch of antiserum was dependent on the life-time of a particular animal. 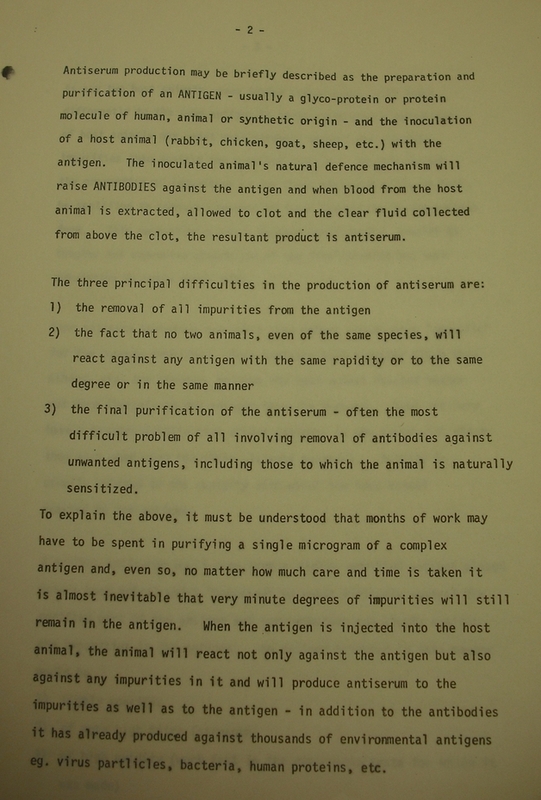 Every time an animal died, other animals had to be tested for another source of antiserum. All of this was time-consuming as well as laborious. 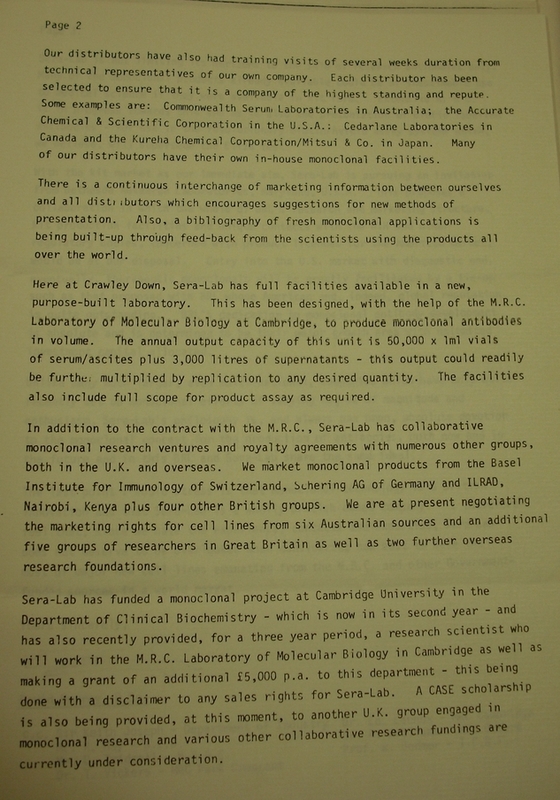 Click here to see the correspondence relating to Sera-Lab's launch of monoclonal antibodies, the contract it established with the MRC and a list of the types of cells it marketed. 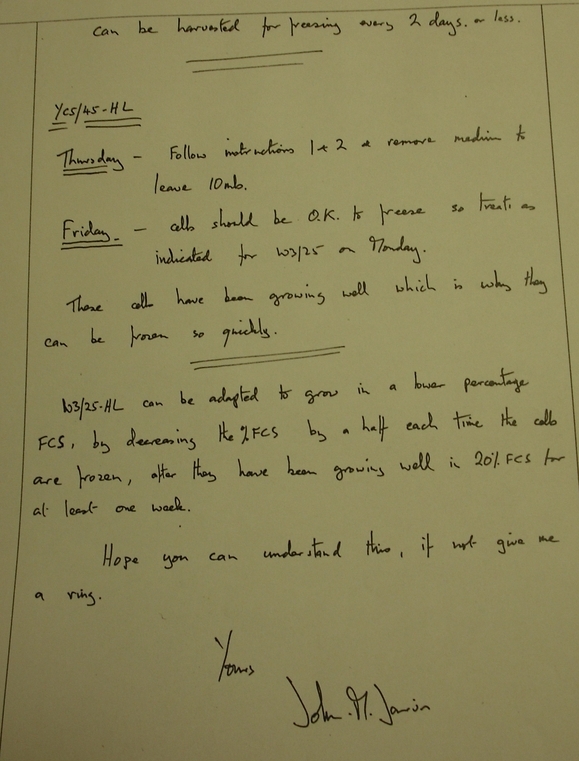 The contract between Sera-Lab and the MRC took time to be finalised. First drafted in November 1977, it was only finalised in October 1978. 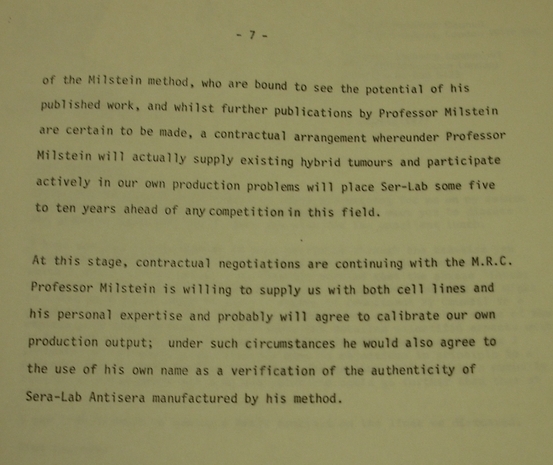 By this time Sera-Lab was already well under way, with the commercialisation of Milstein's first cell lines. As early as February 1978, the company included Milstein's myeloma cell line in its marketing catalogue, alongside the company's other antiserum products. This represented the first commercialisation of cell lines for the production of monoclonal antibodies. The number and type of samples from Milstein distributed by Sera-Lab increased over time. Murray also moved quickly to source monoclonal antibodies from other scientists for distribution. Taken as a whole, the relationship between Sera-Lab and Milstein was to their mutual advantage. Milstein's laboratory helped Sera-Lab set up its facilities for the supply of monoclonal antibodies. In return Sera-Lab sponsored a research scientist to work at the Laboratory of Molecular Biology in Cambridge. Click here to see some correspondence sent to Sera-Lab outlining how to maintain monoclonal antibodies. In addition, Sera-Lab's distribution of the cell lines helped shift some of the burden of distribution Milstein and his team had experienced in the early years. Nonetheless, he was cautious about which cells he was willing to release. He was, for example, reluctant to give Sera-Lab cell lines with significant commercial potential, like those that would be useful for the purification of interferon. Despite this, however, within a short space of time the company had become the focal point of call for researchers. 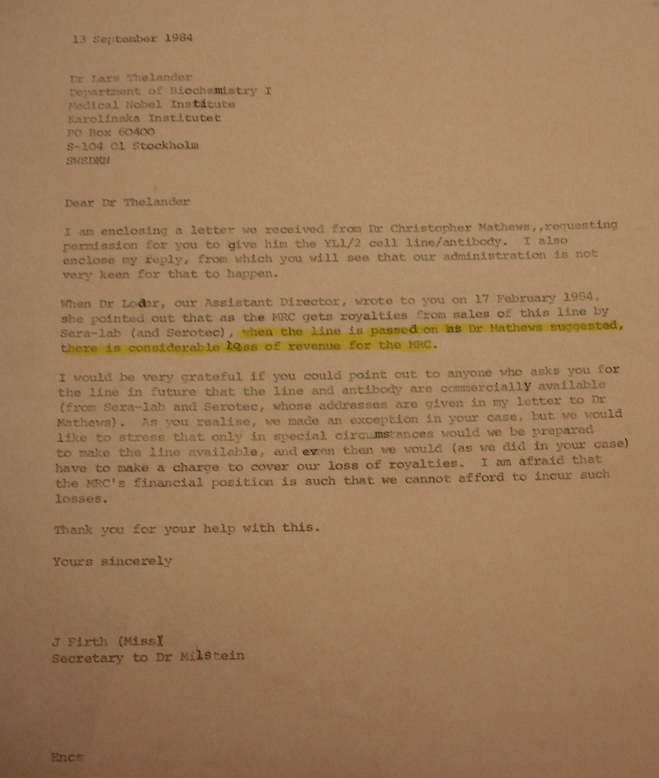 Robert Tindle, the head of research at Sera-Lab from 1984, recalls that the company essentially acted as a clearing house, like a newsagent where a customer can buy any newspaper. As early as April 1979, Sera-Lab was receiving requests daily for the monoclonal antibodies made by Milstein and his colleagues. 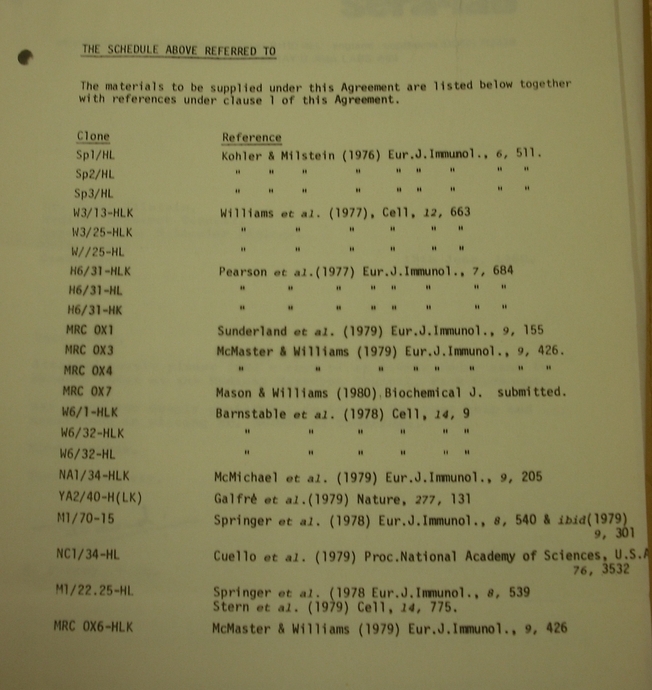 Sera-Lab's catalogue for 1979 listed 22 antibodies, most of them originating from MRC researchers. Click here for Milstein's thoughts on the most appropriate means for distributing his cells. By 1983 the Sera-Lab catalogue listed 68 monoclonal antibodies and many other reagents for making monoclonal antibodies. Three years later, Sera-Lab's catalogue list had grown to 221 monoclonal antibodies. At that time the company had one of the most extensive collections of monoclonal antibodies then in existence. Researchers could buy such monoclonal antibodies either in purified form, or as ascites or supernatant. Production conformed to the US Federal Drug Administration good manufacturing practice standards where monoclonal antibodies were supplied in large volume. 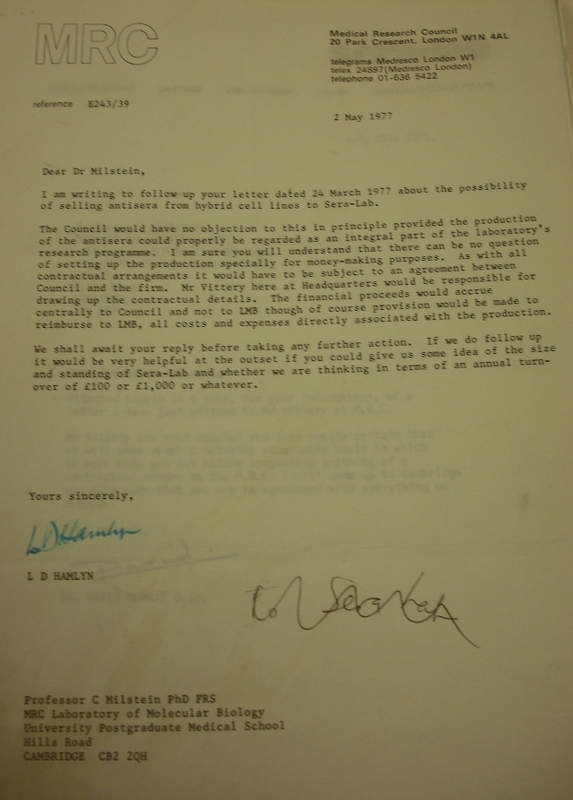 Despite its being at the forefront of commercialising monoclonal antibodies, Sera-Lab was largely overlooked by the British government and policy-makers eager to make up for the lost opportunity of patenting the technology. Its existence was ignored, for instance, in the publicity surrounding the establishment of Celltech, a British biotechnology company founded to exploit British innovations such as monoclonal antibodies. Unlike Sera-Lab, which had been built up on a boot-strap basis, Celltech was founded with government backing and £12 million venture capital. Click here to see Murray's overview of the role Sera-Lab played in the early commercialisation of monoclonal antibodies. Murray was highly critical of the way his company's pioneering role in the commercialisation of monoclonal antibodies went unrecognised. From his perspective, the company had laid an important foundation for the industrial development of the technology, which the company promoted not only as reagents for laboratory use, but also for the development of diagnostics. 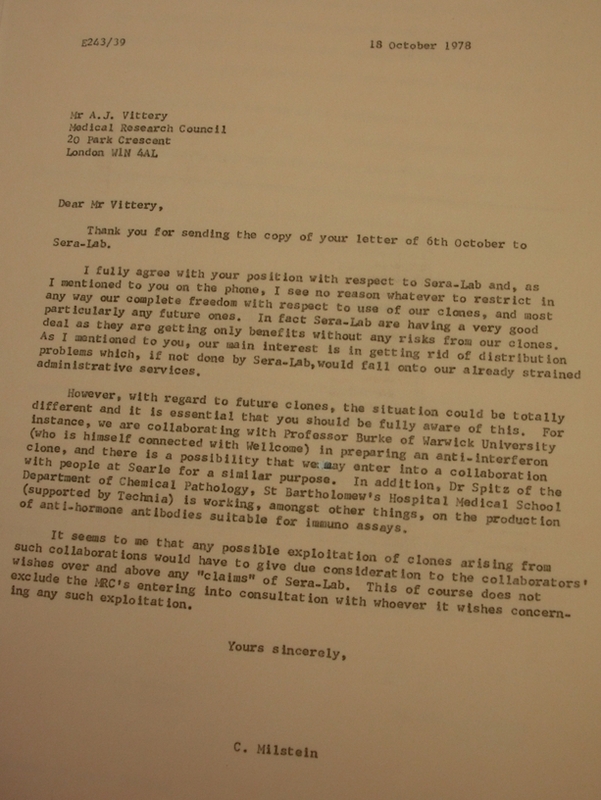 He expressed his feelings in a letter that he sent to Milstein in July 1980 and copied to Sir Keith Joseph, the Conservative Minister, then involved in trying to protect British interests in biotechnology. In it, he pointed out that Sera-Lab was a British company, exploiting a British invention, and therefore deserved government support. Its failure to do so was particularly striking given the government's concern over the failure of the National Research Development Corporation (NRDC) to patent to the technique, which it blamed for the slowness of British companies to commercialise biotechnology. 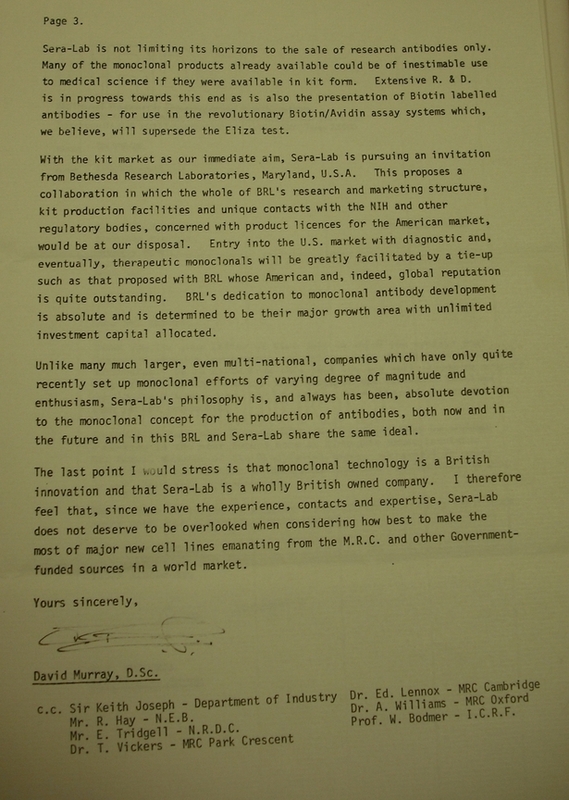 Sera-Lab was one of several companies that Milstein and the MRC enaged to distribute the cell lines from the Laboratory of Molecular Biology. One of the companies that they also worked with was Flow Laboratories in Scotland, a supplier of cells, media and sera. It was a subsidiary of Flow General Inc an American company founded by Michael Wall, who would later help establish Centocor in 1979, one of the first American companies to commercialise monoclonal antibodies for diagnostics and therapeutics. Click here to see correspondence concerning other distributors and the implications this had for scientists in terms of access and payment. 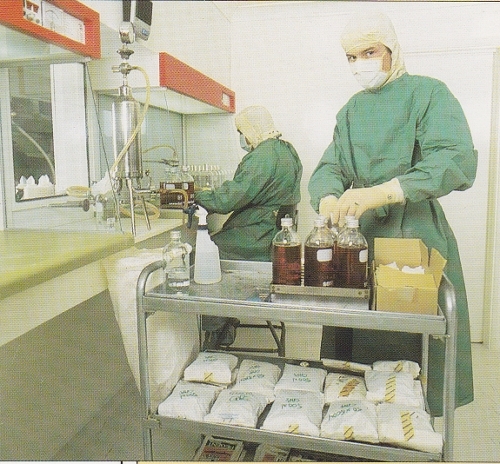 Over time, commercial distributors replaced Milstein's laboratory as the main source of cell lines for the making of monoclonal antibodies. This inevitably entailed new financial arrangements. 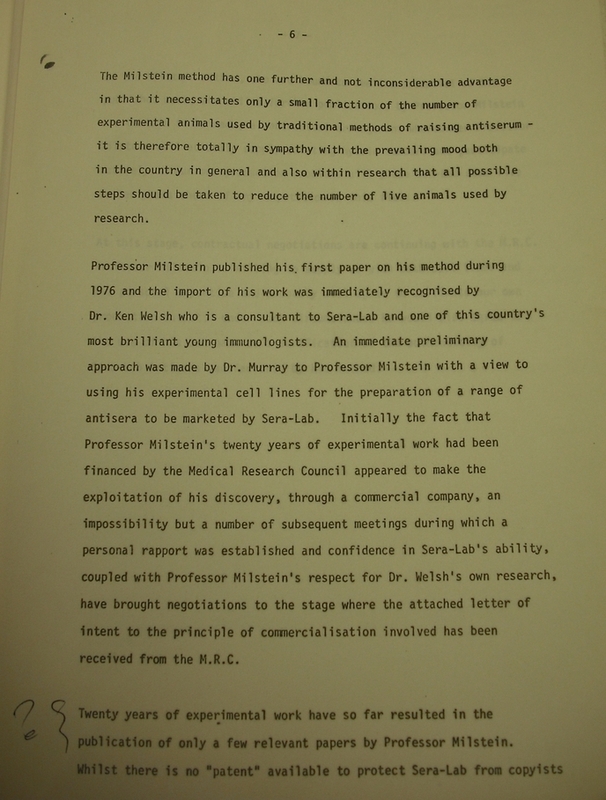 In the early days Milstein's laboratory had been largely happy to provide cell lines provided transport costs were paid, but this was to change. With patents at stake and monoclonal antibodies now commercially valuable, new procedures had to be put in place. 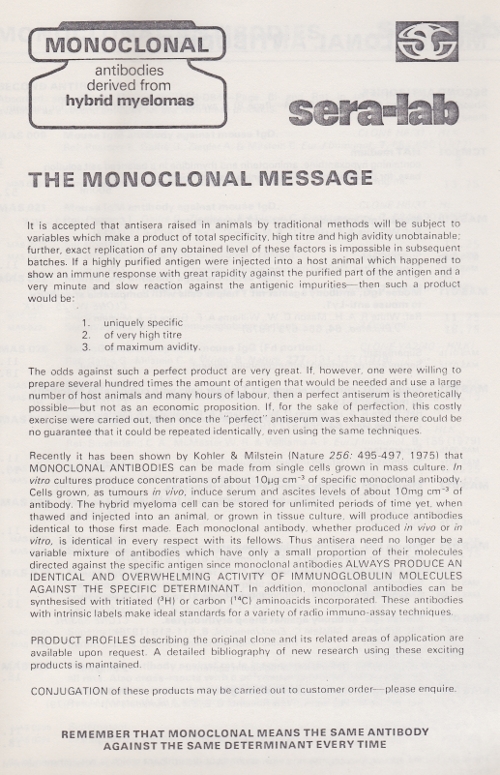 This shows a page from Sera-Lab's catalogue, 1981, advertising the advantages of monoclonal antibodies. Companies expected to be rewarded from the process of distribution, and royalties had to be paid on the cell lines that were now being patented. This inevitably made the transactions more commercial. Researchers were increasingly discouraged from obtaining their cells directly from Milstein's laboratory or from passing cells between themselves. One of the reasons for the shift was that any exchange between scientists reduced revenue for the companies supplying the cell line, thereby decreasing any royalties that could be passed on to the MRC. Milstein not only distributed his cell lines through commercial channels. He also partnered with Melvin Cohn, an immunologist based at the Salk Institute in San Diego, to supply his cell lines through a cell bank Cohn had set up in the early 1970s to serve as a repository for murine immune-related culture and tumour cell lines, many of which originated from Michael Potter at the National Institutes of Health. It had funding from the National Cancer Institute. 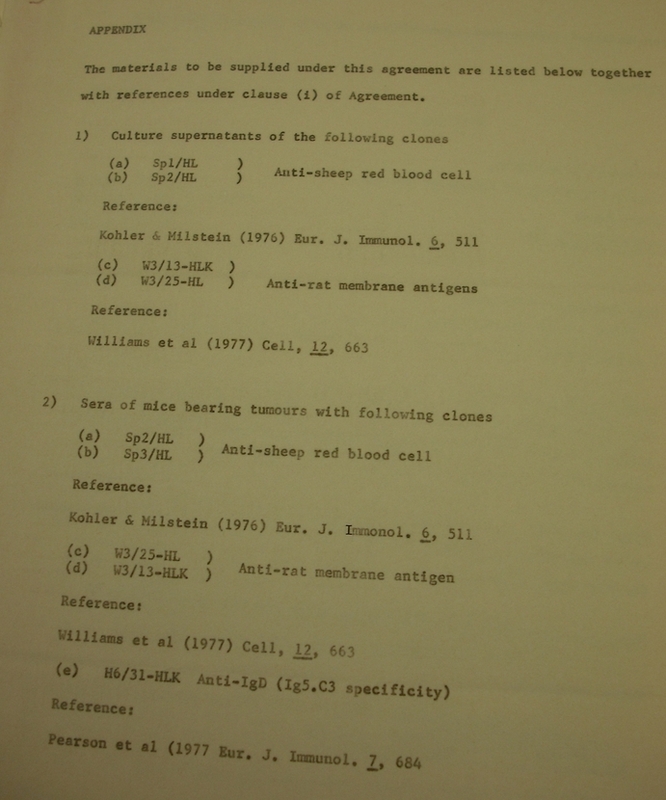 Cohn first received the P3-X63Ag8 myeloma cell line from Milstein in January 1977. P3-X63Ag8 was in fact a derivative of one of the myeloma cell lines supplied from Cohn's Cell Bank and was the fusion partner Köhler and Milstein had used to produce the hybrid cell that secreted the first successful monoclonal antibodies. By June 1977 Cohn reported that he was so inundated with requests for the P3-X63Ag8 myeloma cell that he wished to advertise it in the catalogue of the Salk Institute Cell Bank. 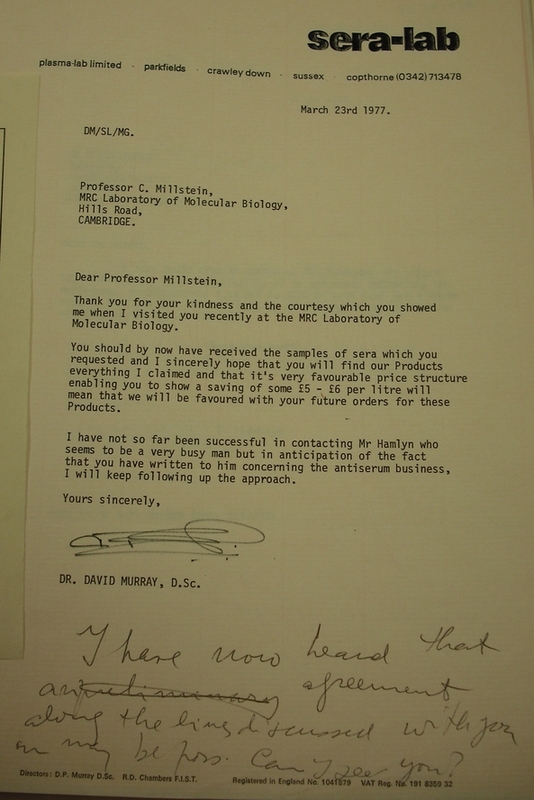 For Milstein and his staff, Cohn's offer to distribute the cell line was very helpful. It meant that they could now refer scientists based in America to Cohn's laboratory, thereby circumventing the need to negotiate the international shipping of the cells and bypassing the need for customs clearance. By 1979 the catalogue had seven hybridomas listed. Over the following years, the Salk Institute would become a major repository for many different monoclonal antibody cell lines. 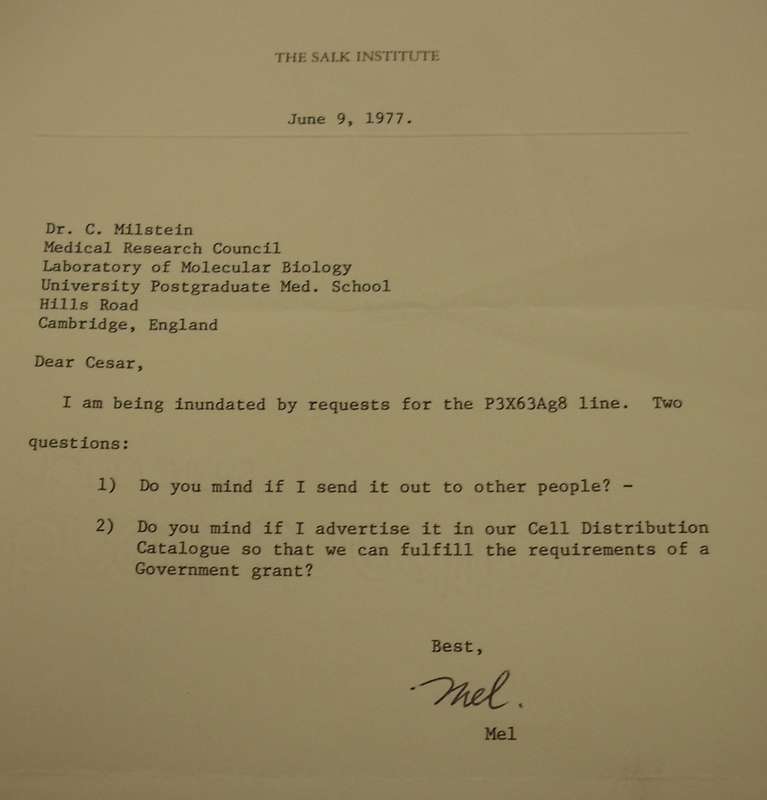 This letter from Melvin Cohn based at the Salk Institute in San Diego requesting permission to advertise Milstein's P3-X63Ag8 myeloma cell line in his cell bank's catalogue indicates how popular the cell line was becoming by June 1977 among researchers. 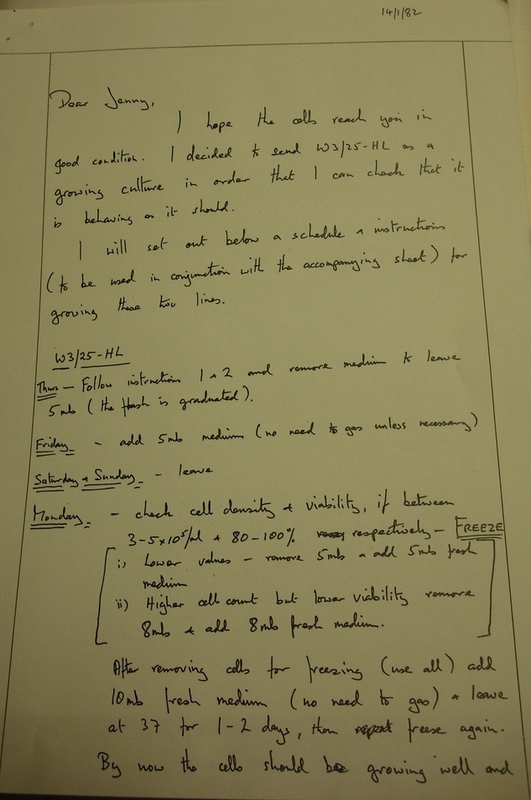 Churchill College Archives, Milstein Papers, file MSTN/C285.